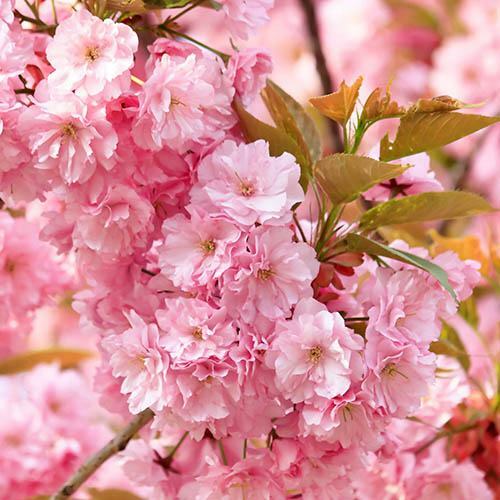 An incredible sight in full bloom, its no wonder Cherry Kanzan is one of the most popular of all flowering cherries. Awarded the RHS Award of Garden Merit for its performance and reliability, it is incredibly easy to grow and fully winter hardy. 'Cherry Kanzan' has delightful coppery red foliage that turns a spectacular, rich, golden colour in autumn, and will remain a centrepiece of any garden all year long. Supplied as a 1.2m tall, well-branched grafted bare root tree. An incredible sight in full bloom, its no wonder Cherry 'Kanzan' is one of the most popular of all flowering cherries. Awarded the RHS Award of Garden Merit for its performance and reliability, it is incredibly easy to grow and fully winter hardy. Completely smothering each branch in divinely scented, soft-pink, fully double flowers each April, 'Cherry Kanzan' has delightful coppery red foliage that turns a spectacular, rich, golden colour in Autumn, and will remains a centrepiece of any garden all year long. Often planted in a border or lawn, these wonderful trees will look just as great in pots on your patio. Best planted in autumn, from October to November choose a sheltered location (to protect the blossom when it emerges in the spring). Dig a square hole as deep as the roots and approximately 1.5x as wide. Add Mycorrhizal fungi to the planting hole to help the plant establish quicker. Spread the roots gently and place into the planting hole. Mix well rotted compost or manure with the soil taken from the hole and then use to backfill around the tree. Keep the area free of competing weeds and protect the tree with a rabbit guard if necessary to protect your young cherry tree. Pruning your tree for the first few years will create a more balanced branch framework - prune after flowering and before the new shoot growth appears to create an open goblet shape - removing any twisted, damaged or dead branches.